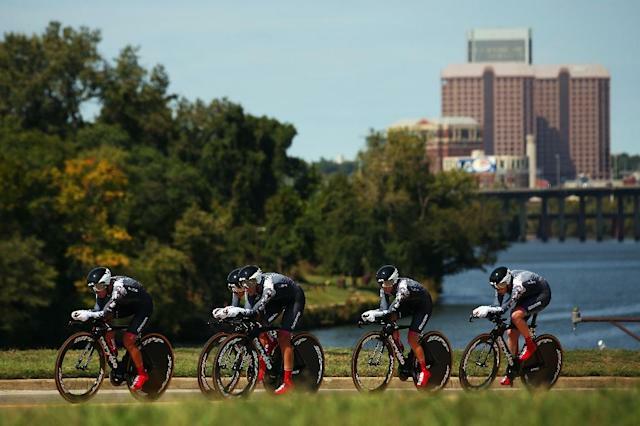 Richmond (United States) (AFP) - Velocio SRAM captured a fourth consecutive women's team time trial title Sunday at the World Road Cycling Championships with Germany's Trixi Worrack making herself the only rider on each winning squad. The German-based lineup that won the past three crowns as Lululemon completed the 38.6km (24 miles) trek in 47min 35.72secs to edge Dutch-based Boels Dolmans by 6.22 seconds. Worrack was joined in the winning effort by compatriots Lisa Brennauer and Mieke Kroeger, Canada's Karol-Ann Canuel, Alena Amialiusik of Belarus and Italy's Barbara Guarischi. It was the third team crown in a row for which Brennauer had riden. She defends her individual time trial crown on Tuesday. Velocio led by 11.26 seconds after 10km but Boels Dolmans, powered by Britain's Lizzie Armitstead, trimmed the margin to 6.08 seconds after 20km and moved 3.13 seconds in front after 30km. Dutch rider Ellen Van Dyk struggled over the final climb for Boels Dolmans and Velocio battled the closing ascent as well, Kroeger and Guarischi having fallen back as the final foursome powered to the final straightaway and pulled back enough time for the victory. Velocio had not lost in more than three years until falling at the Vargada World Cup in Sweden to RaboLiv, which finished third, 56.12 seconds adrift.